The function of fibroblasts is related to maintenance and tissue metabolism. They are in activated state of metabolism. Fibroblasts provide the structural fibers and ground substance of connective tissue. Compared to other fibroblast cell types, dermal fibroblasts show only weak affinity to change into other cell types. For cell replication, higher amounts of growth factors are required. Hence proliferation can be stimulated by the presence of our growth factor (FGF). 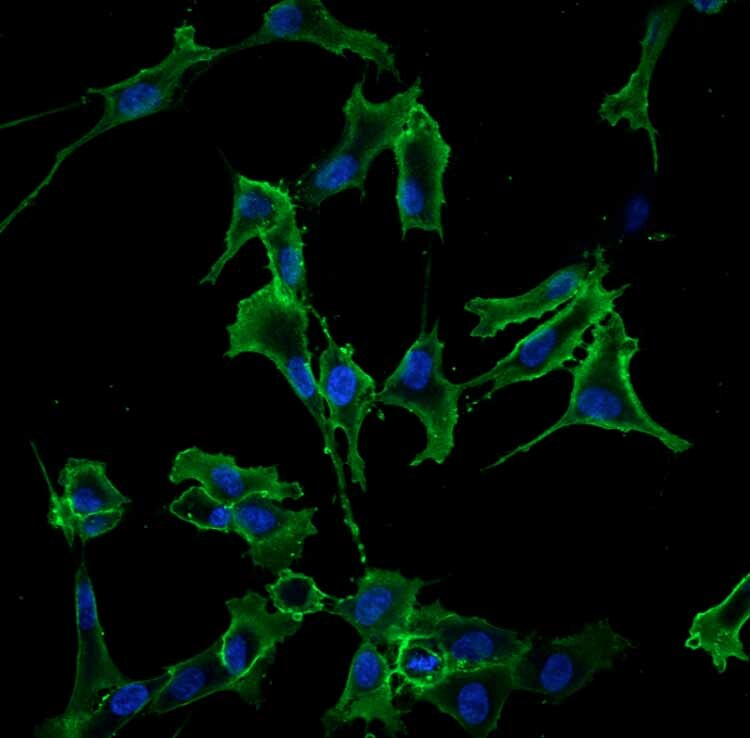 Normal human fibroblasts, derived from juvenile foreskin, stained for specific surface antigen CD90 (green), nuclei stained with Hoechst 33342 (blue), passage 1 after cryopreservation. default_titleReady to use, delivered in 500 ml bottles. default_titleLow-serum medium, chemically defined. Contains 5% serum. default_titleServes both juvenile and adult human dermal fibroblasts. default_titleSpecially designed and optimized to support the in vitro growth of juvenile and adult primary human fibroblasts. default_titleOptimized to synthesize the extra cellular matrix and collagen. default_titlePerfectly fits and optimized to cryopreserved PRIMACYT Human Dermal Fibroblasts (recommended). default_titleProliferating cultures are assured for experimental use for at least 16 population doublings. Subcultures and additional population doublings are usually possible. But resulting growth rate, the ability to sufficiently response biologically, and the cell function might deteriorate with subsequent passages. default_titlePlease contact us if you want to apply the growth medium to non-human fibroblasts, such as cynomolgus monkey, rat, mouse or other and fibroblast cell lines. PRIMACYT FGM is delivered in bottles of 500 ml each. default_titlePRIMACYT fibroblast growth medium FGM is for in vitro research only. They may not be used for diagnostic or therapheutic purposes. default_titleProduct warranty limits our liability to replacement of this product. No other warranties of any kind are provided by PRIMACYT.